How to use servo in pixhawk? how can i use aux output channel? In QGroundControl you can configure the parameters directly. 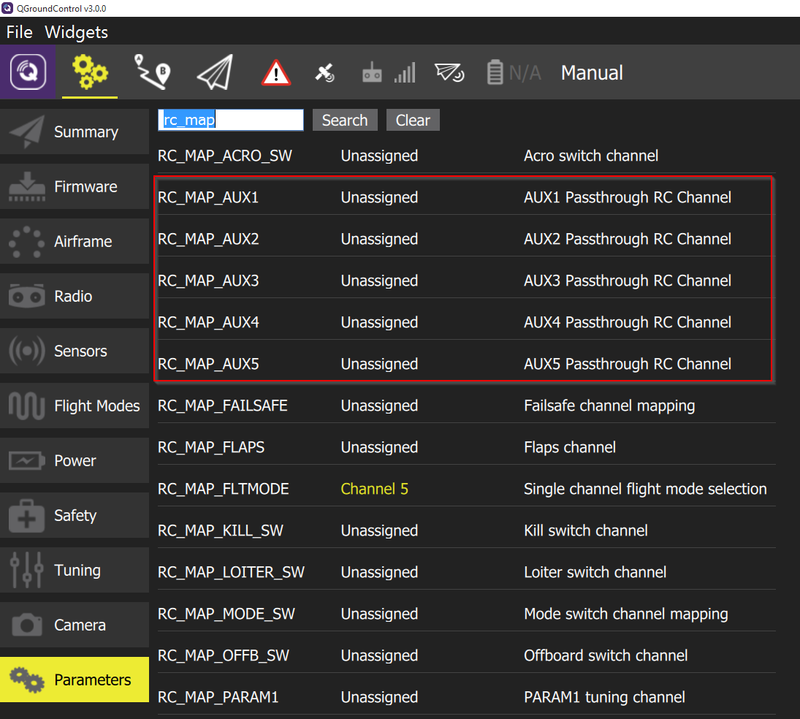 I think your needed AUX Channel setting is in RC_MAP_AUX#, where you can select your RC# Channel input. If I don't forget, I'll post a screenshot tonight. Finally, switching the servo on the transmitter triggers the servo on the receiver, but not the one on the copter. Is there something I'm missing. I'm running the latest master branch of PX4, but getting nowhere with it. Can you elaborate on what you mean by "User-Hooks"? I'm trying to do the same thing you are, but having issues. I need to get my volt meter back from my friend, so I can diagnose these things myself. I tryed these steps but i am not geting pwm signal at AUX1, I am trying to paas signal through AUX1 when i switch on my Futuba RC CH9. Have you also powered the MAIN or AUX rail with a 5V source, for example using a 5v BEC? So for example if you just plug in your servo to a MAIN motor port (for testing ), is the servo moving? I assigned AUX1 to AUX5 from channel 6 to channel 10 respectively with my Futuba RC and i connected one by one AUX1 to AUX5 with Oscilloscope for test pwm signal is coming or not when i am switching my RC channel, but in Oscilloscope it always showing one fixed PWM signal, I am not able to get PWM signal from any AUX. I want PWM signal when i will switch my RC channel. AUX mixer setting may be needed if your Airframe does not use AUX outputs. Still I am facing same problem.....?? Quad-copter X Genric. Is in this configuration AUX output not available? Yes, it is. AUX mixer is not set in the quadcopter X generic airframe setting. There is no quad X frame which has Aux output. And then build and upload firmware. Have you tried Mount to Enable MNT_DO_STAB ? See full documentation here. What error is it? and following infos are needed for me to solve it if you want.